Stripe is a set of unified APIs and tools that enables businesses to accept and manage online payments. Select an Stripe Klip from the Gallery. In the dialog box, you are asked for your Stripe Secret Key. To find your Stripe Secret Key, login to your Stripe account. In Stripe, select Your Account. Note: If you do not see your API Keys, this means that you have either Read & Write or Read Only access, and are not an administrator for the account. You will need to get in touch with the administrator of your account for the API Keys, or request that they make you an administrator in the account's team settings. 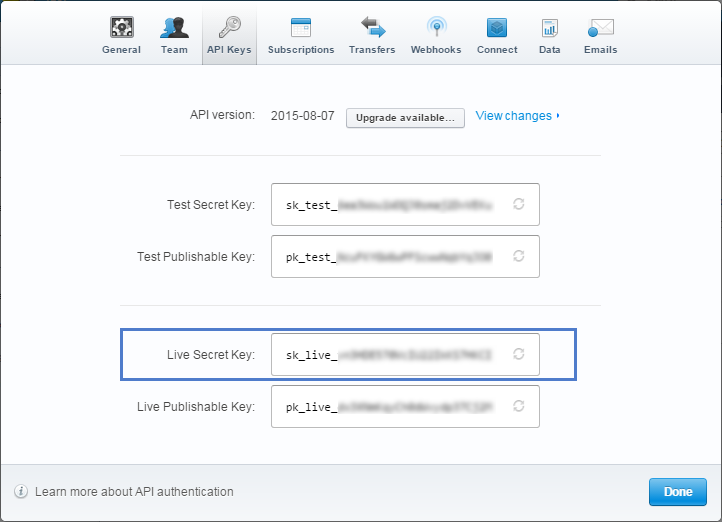 In Stripe, copy your entire Live Secret Key and paste it into Klipfolio. For example, sk_live_123abc123abc. Note: If your Stripe account is in test mode, then use your Test Secret Key instead.